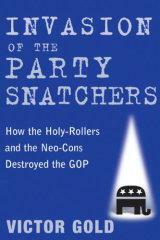 Victor Gold, Invasion of the Party Snatchers: How the Holy-Rollers and the Neo-Cons Destroyed the GOP (Naperville, Ill.: Sourcebooks, 2007), 246 pp., $26.95. The Republican party, nicknamed the “Grand Old Party,” isn’t looking so grand these days. Pompous paladins and frenetic activists alike remain shell-shocked over the GOP’s congressional losses last November. Discord is growing between the Republican legislative minority and President George W. Bush, who appears more isolated from public opinion and disconnected from reality every day. The Iraqi foreign policy disaster threatens to wreak even more havoc among Republicans in 2008. Despite current polls showing the top GOP candidates to be competitive with the leading Democrats, gloom is spreading among Republican professionals who fear having to campaign next year, their necks wrapped with the twin albatrosses of George W. Bush and the Iraq war. GOP congressmen find themselves caught between a dwindling majority of steadfast Republican voters who insist that lawmakers support the administration despite its continual dissembling, policy fantasies, and exuberant incompetence, and the vast majority of Democrats and independents, as well as a growing minority of Republicans, who are demanding a change in Iraq policy. Yet the political mess is secondary to the policy disaster. The GOP has become the party of war, committed to Wilsonian meddling in hate-filled lands lacking the most basic civic infrastructure. Iraq has created terrorists and spread terrorism, as well as provided a national training ground for anti-American jihadists. At home the Republican party has become the advocate of the Nanny State, bloated, expensive, intrusive, and inept. The pursuit of political power and financial spoils held Republicans together over the last six years. But losing their lock on Washington’s levers of power has destroyed GOP unity. Increasingly traditional conservatives, appalled at the party’s direction, are speaking out. Taboos remain against speaking truth to power: the Bush administration treats dissent as equivalent to treason, the Democrats are equally unprincipled, and the Republican establishment so far dismisses any criticism. But the taboos are finally being broken. The latest GOP champion to assail the Republican Party, and particularly the Bush administration, is Victor Gold. Few political activists have a stronger Republican pedigree than Gold. A press aide for 1964 presidential nominee Barry Goldwater and later Vice President Spiro Agnew, Gold also was a speechwriter and adviser to President H.W. Bush. Gold coauthored the latter’s biography. He also coauthored a novel with Lynne Cheney, wife of the vice president. He cheered the Republican takeover of Congress in 1994 and the presidency in 2000. He was one of those well-connected GOP activists whose loyalty appeared well-nigh absolute. No longer. Gold has penned a devastating critique of the modern Republican party, Invasion of the Party Snatchers. It is more an angry, emotional rant than an academic treatise. But that adds to its power. Gold is a loyalist betrayed, a partisan set adrift. He explains, in clear, simple language, how the Republican Party has not just strayed from its philosophical heritage, but trashed the principles and memories of those who made the modern GOP. “So outraged was Newt Gingrich at Bill Clinton’s scandalous behavior that he vowed to let no day pass without rising to condemn it  this while Gingrich himself, as his wife later discovered, was carrying on a five-year affair with a House aide a quarter-century his junior. From the perspective of one who knows both father and two sons, he argues that Jeb far better represents his father. As for George W., writes Gold, the similarity with George senior “ends with even a cursory look at where the energy goes and what the schedule includes.” The differences, Gold argues, are many. Gold turns his vicious wit on George W. Bush, Richard Cheney, Republican legislators, and the many neocon warrior wannabees. No surprise with a tirade like this, Gold sometimes is over-the-top and off-target. But in the main, he carries his attacks home with energy and verve. Gold’s inflamed rhetoric  denouncing “theocracy” and “Holy Rollers”  exaggerates the threat posed by these largely well-meaning though misguided people. Nevertheless, there is substance to his critique. For instance, he points to the tragic case of Terri Schiavo, when a Republican president and Republican-controlled Congress sought to intervene in a family crisis and overturn a state legal proceeding. Gold wraps up Invasion of the Body Snatchers by discussing how far short of Barry Goldwater fall today’s GOP politicians, including Sen. John McCain (R-Ariz.), who holds Goldwater’s old seat. Of even greater concern is the fact that the current and putative Republican chief executives fall so far short of what we should expect in a president. Gold answers yes, if just barely, though doing so will not be easy. It is time for Republicans across the country to answer the same two questions, with the same acerbic honesty exhibited by Victor Gold in Invasion of the Party Snatchers.